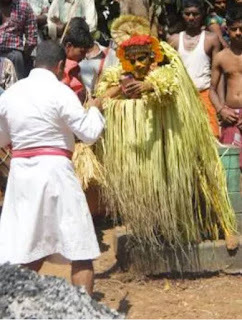 The worship of spirit deities is prevalent in Dakshina Kannada, Udupi and Kodagu districts of Karnataka. 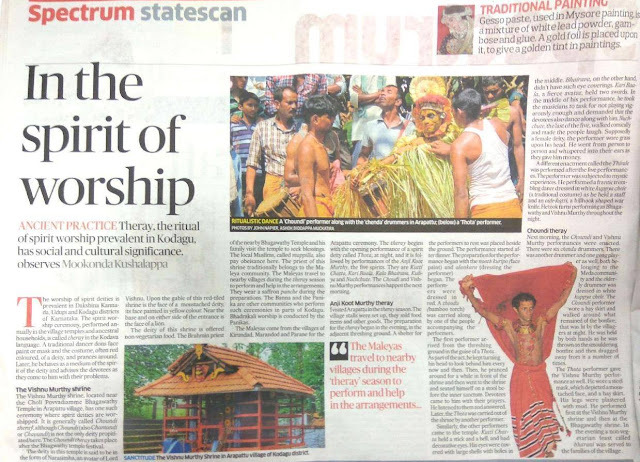 The spirit worship ceremony, performed annually in the village temples and ancestral households, is called theray in the Kodava language. A traditional dancer dons face paint or mask and the costume, often red coloured, of a deity, and prances around. Later, he behaves as a medium of the spirit of the deity and advises the devotees as they come to him with their problems. 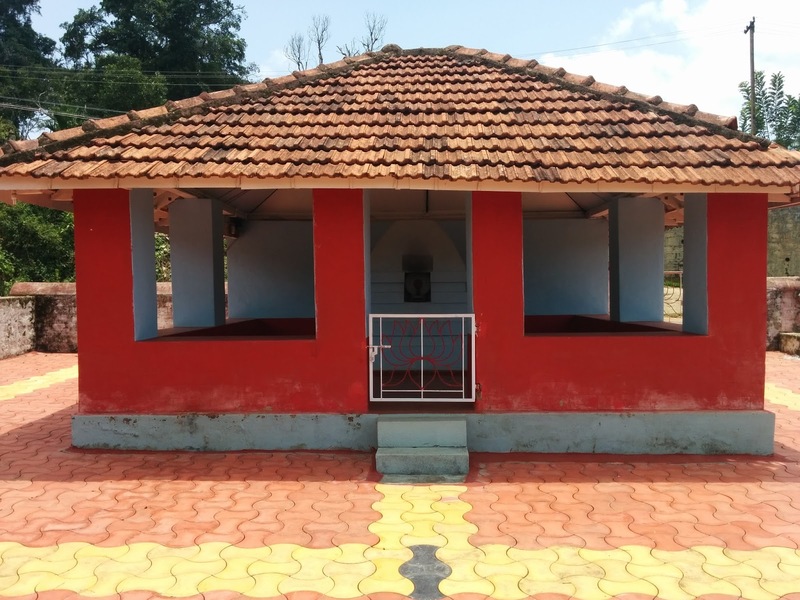 The Vishnu Murthy shrine, located near the Choli Povvadiamme Bhagawathy Temple in Arapattu village, has one such ceremony where spirit deities are worshipped. It is generally called Choundi theray, although Choundi (also Chamundi or Chavundi) is not the only deity propitiated here. The Choundi theray takes place after the Bhagwathy temple festival. The deity in this temple is said to be in the form of Narasimha, an avatar of Lord Vishnu. Upon the gable of this red-tiled shrine is the face of a moustached deity, its face painted in yellow colour. Near the base and on either side of the entrance is the face of a lion. The deity of this shrine is offered non-vegetarian food. The Brahmin priest of the nearby Bhagawathy Temple and his family visit the temple to seek blessings. The local Muslims, called mappilla, also pay obeisance here. The priest of this shrine traditionally belongs to the Maleya community. The Maleyas travel to nearby villages during the theray season to perform and help in the arrangements.They wear a saffron panche during the preparations. The Banna and the Panika are other communities who perform such ceremonies in parts of Kodagu. Bhadrakali worship is conducted by the Panikas. The Maleyas come from the villages of Kirundad, Marandod and Parane for the Arapattu ceremony. The theray begins with the opening performance of a spirit deity called Thota, at night, and it is followed by performances of the Anji Koot Murthy, the five spirits. They are Kutti Chatta, Kari Baala, Kala Bhairava, Kuliya and Nuchchute. The Choudi and Vishnu Murthy performances happen the next morning. I visited Arapattu in the theray season. The village stalls were set up, they sold food items and other goods. The preparation for the theray began in the evening, in the adjacent threshing ground. A shelter for the performers to rest was placed beside the ground. The performance started after dinner. The preparation for the performance began with the nooth kuripo (face paint) and alankara (dressing the performer) began. The performers were dressed in red. A thoodu (bamboo torch) was carried along by one of the people accompanying the performers. The first performer arrived from the threshing ground in the guise of a Thota. As part of the act, he kept turning his head to look behind him every now and then. Then, he pranced around for a while in front of the shrine and then went to the shrine and seated himself on a stool before the inner sanctum. Devotees came to him with their prayers. He listened to them and answered. Later, the Thota was carried out of the shrine by another performer. Similarly, the other performers came to the temple. Kutti Chatta held a stick and a bell, and had decorative eyes. His eyes were covered with large shells with holes in the middle. Bhairava, on the other hand, didn't have such eye coverings. Kari Baala, a fierce avatar, held two swords. In the middle of his performance, he took the musicians to task for not playing vigorously enough and demanded that the devotees also dance along with him. Nuchchute, the last of the five, walked comically and made the people laugh. Supposedly a female deity, the performer wore grass upon his head. He went from person to person and whispered into their ears as they gave him money. A different enactment called the Thirale was performed after the five performances. The performer was subjected to mystic experiences. He performed a frantic trembling dance dressed in white kuppya chele(a traditional costume) as he held a staff and an oide-katti, a billhook shaped war knife. He took turns performing as Bhagawathy and Vishnu Murthy throughout the night. Next morning, the Choundi and Vishnu Murthy performances were enacted. There were six chenda drummers. There was another drummer and one gong player as well, both belonging to the Meda community and the elderly drummer was dressed in white kuppya chele. The Choundi performer wore a hay skirt and walked around what remained of the bonfire, that was lit by the villagers at night. He was held by both hands as he was thrown on the smouldering bonfire and then dragged away from it a number of times. The Thota performer gave the Vishnu Murthy performance as well. He wore a steel mask, which depicted a moustached face, and a hay skirt. His legs were plastered with mud. He performed first at the Vishnu Murthy shrine and then at the Bhagawathy shrine. In the evening a non-vegetarian feast called bharani was served to the families of the village. 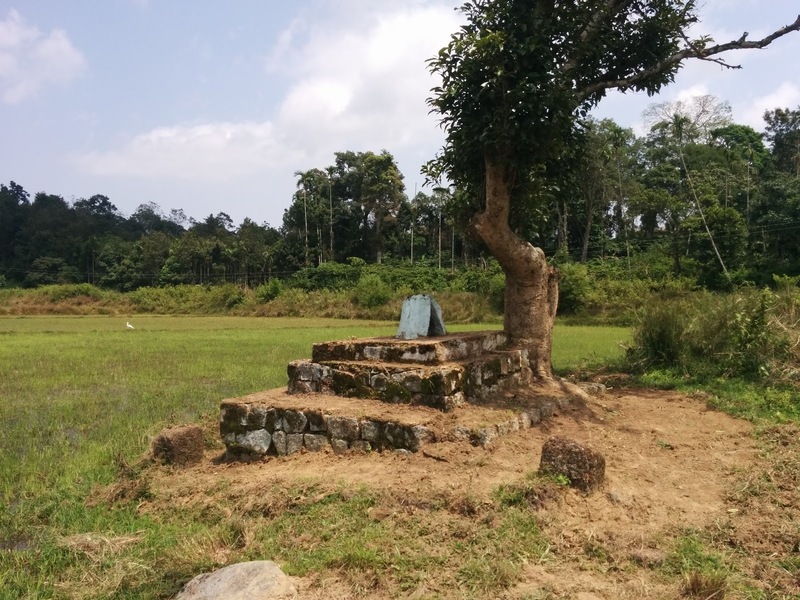 In Kodagu, a certain folk song describes the ancient local government in the region. Eight hereditary chieftain clans called the desa thakka (regional chieftains) resided in places spread across Kodagu. The Mathanda pronounced as 'Maa-ththan-da', clan were one of these eight. When I had been to Bollumad village of Beppunaad region I chanced upon the sepulchre of Diwan Mathanda Appachu. It lies in the family lands of his descendants. This tomb has a small dome and turrets on top with four basava bulls at the corners of the flat roof. Nearby are two memorials to his predecessors. One memorial is a white stone upon a platform on the grave of Mathanda Maanu and under a tree. Maanu has no living descendants. 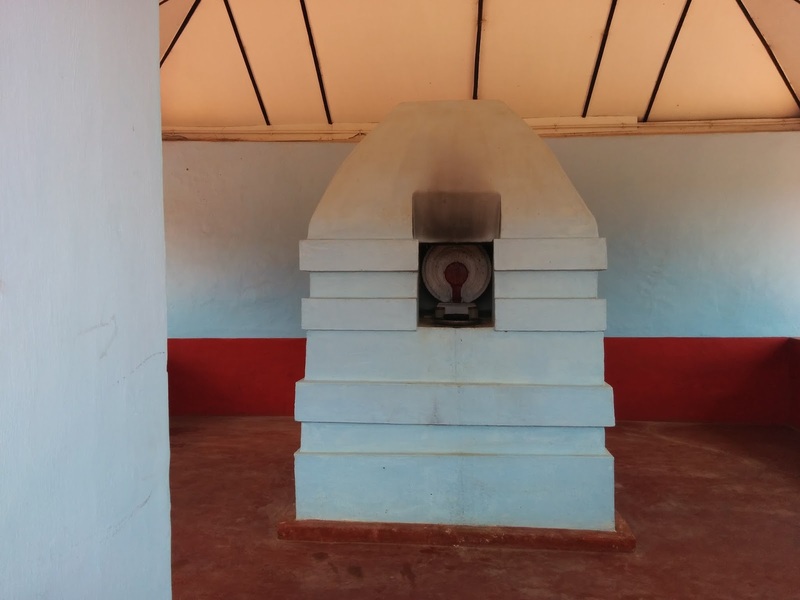 The other is a small red shrine, called a Kaimada, which is dedicated to Maletira Karicha of Kedamallur, the common ancestor of all Mathanda members existing today. Oral tradition claims that a particular sorcerer had troubled a Raja of Kodagu. The Raja had a reward placed upon the sorcerer's head. Karicha, as a young boy, had befriended the sorcerer who gradually took the boy into his confidence. The boy followed him everywhere and the sorcerer didn't mind at all. Karicha noticed that the sorcerer never put down his weapons as he didn't trust anybody enough, not even Karicha. Once the two came to a stream where they wished to wash their faces and limbs before having lunch. Karicha put down his weapons and washed his hands and feet first. Not suspecting anything to be amiss, the sorcerer also put down his weapons and stood on the bank of the stream. Finding this to be the opportune moment, Karicha sprang up, grabbed his weapons and killed the sorcerer. When the Raja got the news he was highly pleased and so rewarded Karicha. The 1870 'Gazetteer of Coorg' by Rev. 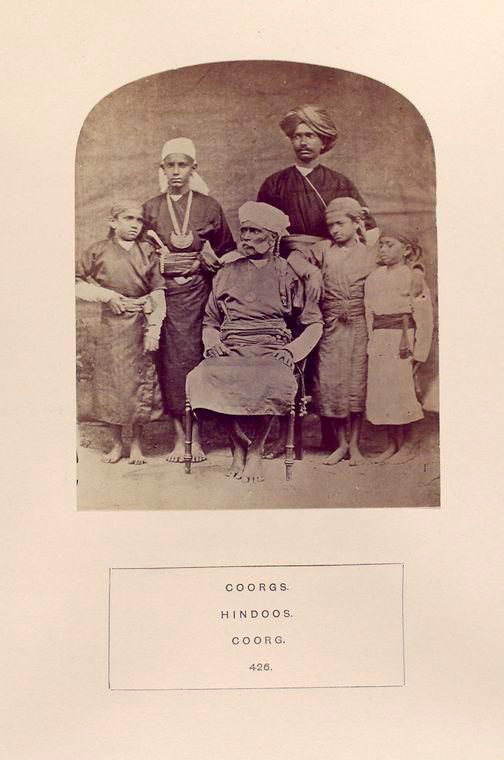 G. Richter, a British missionary, and educationist, has a photograph labeled as 'Coorgs: grandfather, father and grandsons'. The seated grandfather sports a handlebar mustache, a mark of distinction. According to the 1875 volume of 'People of India' series, where the same picture is labeled as 'Coorgs. Hindoos. Coorg', he is called 'Mattana', 'Soobadar of Mercara', shown along with 'his younger relatives'. Based on a list replicated in folklorist Nadikerianda Chinnappa's 1924 book Pattole Palame, I have been able to identify this 'Mattana', 'Madanta' and 'Appachanna' as Subahdar Mathanda Appachu, later Head Sheristadar and Diwan. The picture hence shows Mathanda Appachu, his son, and grandsons. 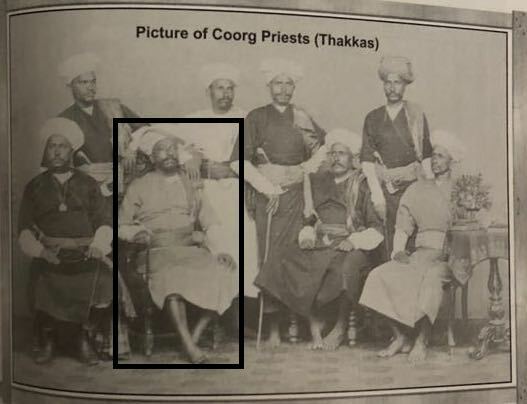 In his book, Richter speaks of 'the present Head Sheristadar Madanta Appachu, a fine old Coorg, of tall stature and martial bearing' on page 337. Again on page 363, Richter talks of 'Subedar Appachanna the present Head Sheristadar'. Later photos have come up. It appears that the father and not the grandfather is Mathanda Appachu. According to the family tree, this makes the grandfather Karicha, father of Appachu. His son is Appachu and Appachu's four sons are the grandsons. The eldest male member of an okka (Kodava family) was called the Pattedara. He owned the land and the property of the family. Like Manu the Hindu law-giver said in his Manusmriti, the man owned his son, wife, and servant. This way Karicha wears his son Appachu's medal. A letter from Chief Commissioner Mark Cubbon to the Superintendent of Coorg mentioned the name of 'Subadar Appachoo'adversely. Appachu, like others of his times, had shown his extreme displeasure to the conversion of one Almanda Somaiah and his family into Christianity. This was despite the British Government's assurances to Somaiah. Yet, years later, Appachu was promoted to Head-Sheristadar, the highest native judicial position. Although Appachu strongly resisted Western religion, he was an active promoter of Western education. 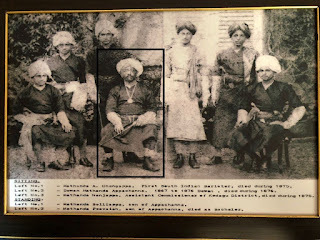 In a letter related to an endowment for the Mercara Central School (Madikeri Government School) dated 17th October 1863 in Madikeri, among the 13 signatories, the third was 'Madanda Appachoo, Head-Sheristadar'. Thus he was one of the founders of the School Endowment Plantation Fund which later became the Coorg Education Fund. In his 1870 Gazetteer of Coorg, Richter notes that though Coorg was jealously guarded by the antagonism of its conservative headmen, it had to yield to the onward march of civilization. Mathanda Appachu, a tall, young man from Beppunaad, Kodagu, rose within the ranks in the Raja's army to become a Karyagara (army officer). 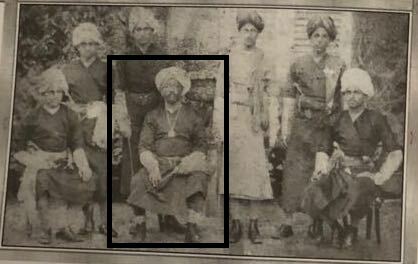 The Raja at that time was Chikka Vira Rajendra, the last Raja of Kodagu. In 1834, the British East India Company sent an army of 6,000 sepoys to invade Kodagu. This force, of the Infantry of the Company's Madras Army, was divided into four columns. One column was to march into the region from the east, one from the north and two from the west until they reach Madikeri, the capital of the princedom. The Kodagu army stood up to defend their small kingdom fiercely. 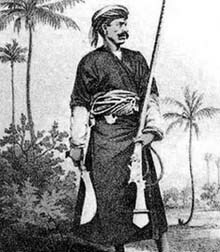 This native army had purchased firearms from the Portuguese and others along the western coast of India. The Northern Column of the Company's Infantry was to meet the Eastern Column near Harangi village. But another village near Somwarpet town secured well by a Bakka and in a forested mountain pass, stood their way. The Bakka was a defensive structure comprising of a mud ditch, fortified with thick wooden palisades. This village was the chief base of the resistance in Kodagu. Karyagara Mathanda Appachu and his men were in the defense of that Bakka. They fought hard against the Northern Column. This Kodagu force aimed their guns and shot at the British from behind wooden palisades and through the arrow-slits of those palisades. Appachu and his warriors killed 48 soldiers, including three officers, and injured 118, within four hours on that one day. No casualties were reported from the Kodagu side. Thus, this Kodagu troop was able to beat the larger and more well-organized East India Company at that time. But the Raja didn't wish to rouse the British anger any further. Hence he wanted his army to avoid further conflict. So he chose to send his Diwans to surrender on his behalf. The Eastern Column was escorted from Kushalnagar town to Madikeri. Three days later, the Raja emerged from hiding. Hence the British were able to take over Kodagu. Appachu was, thus, responsible for the largest resistance provided against the British in Kodagu during that War of 1834. Surprisingly no retaliatory action was taken against Appachu. His deeds were forgiven and his intrepidity was in fact appreciated well. The British didn't wish to distort the existing order. Appachu then swore loyalty to his erstwhile enemy. He was made a Subahdar or native governor. A few years later, Subahdar Mathanda Appachu and sixty men suppressed some rebels who had planned to take over Madikeri. For this Appachu was awarded the 'Coorg Medal'. Since Appachu was also the highest ranking native official of his times, he was known as the Diwan of Kodagu. This popularly assigned designation was unofficial as the British had abolished the Diwan post in Kodagu some years prior. When I had been to Bollumad village of Beppunaad region I chanced upon the sepulcher of Diwan Mathanda Appachu. It lies in the family lands of his descendants. This tomb has a small dome and turrets on top with four basava bulls at the corners of the flat roof. This verse, which most Kodava folk songs begin with, summarises the Kodava religion. God, or the all-powerful superhuman who is pursued with devotion, is named Madeva (or Mahadeva), the great Deva. The Devas are a class of eternal beings who include gods, demigods, angels, spirits and other deities. Every sect or faith on this earth has its own beliefs. But, sadly, they are dismissed as superstitions by those who don't belong to that religion. The Kodava way of living is based on the following of certain rituals and ethics. The laws and beliefs of the Kodava community are from oral tradition. Every Kodava reveres Kodagu, the holy land of their forefathers. In Kodagu, each family and village has a protector deity. The families are guarded by ancestral spirits. The villages are guarded by temple deities and land spirits. God, to the Kodavas, is popularly manifested as the local trinity Kaveramme, Igguthappa, and Guru Karana. Kaveramme, the river deity of Kodagu, is the Kula Devathe (a community's patron god) of the Kodavas. Igguthappa is the Mahaguru (chief preceptor) of the community. Guru Karana, roughly meaning the supreme ancestor, is a common word by which an okka (extended family) addresses the single ancestor who gave rise to them. 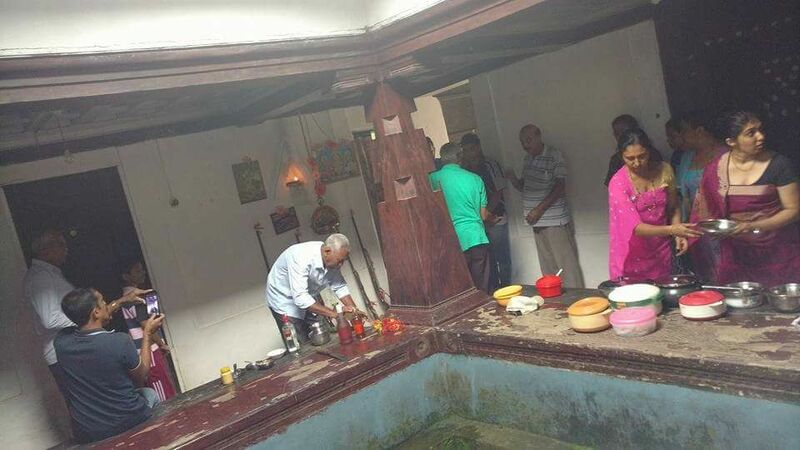 Every okka (family) has a karana (literally meaning cause, but, here, the ancestor) every keri (hamlet) or oni (lane) has a nata (snake), every oor (village) has a Bhagwathy (mother goddess) temple, every deva kaad (sacred forest) has an Ayyappa shrine and every naad (shire) has a Mahadeva (Lord) temple. Ayyappa is the god of the forests and of ancestors. Kaimada shrines are also built for the ancestors. Every day, in each Kodava household, at dawn and at dusk, the house floor is swept clean and the prayer lamp is filled with oil and lit. The prayer lamp is usually a thookbolcha, a hanging ornate lamp, as often seen in South India's temples. This is hung in the nellaki nadubade or as in the present day, in the pooje kombare (prayer room). The nellaki nadubade is the northwestern corner of the central hall in a traditional house. Also, when a Kodava wakes up in bed, he or she says a prayer. When they go to sleep in the night, again they utter a prayer. Kaveri Changrandi, the festival of the goddess Kaveri, is a festival when Kodavas refrain from meat and alcohol. Puttari the harvest festival and Kail Polud the festival of arms are the important feasts of celebration in Kodagu. Karana Kodupo is an important annual observance when offerings are made to a clan's ancestors. The food and drink habits of deceased members of the family are remembered. Accordingly, offerings are made to the dead. The Karana, or the dead Patriarch, is prayed to. Offerings of food and drink made to gods and ancestors are called Medi beppo. Offerings are made to kuliya, or Gulika, the main spirit of the land, as well. Kodavas hold a reverence for life. Hunting animals was done only for the purpose of providing meat (that of rabbits, bats, deer, boars, and others) to the family or to protect the people, livestock and the land from predators (like tigers and elephants). During days that lead to the village temple festival, certain religious restrictions called the deva kattu are observed. Eating meat, consuming alcohol, physically or verbally hurting animals or humans, pulling out plants and cutting trees are forbidden in the period. The reverence of cattle is said to be the chief practice the Kodavas have in common with the Hindus. Cattle, with the exception of buffaloes, are not worked on Mondays. Beef is prohibited among Kodavas. Pork and meats of certain birds and animals are generally allowed for consumption. The consumption of insects, reptiles, and amphibians is not allowed. Drinking alcohol and wine is not prohibited. The dead are either cremated or buried in the family graveyard. The Kodavas believe that the spirits of the dead will linger on after death on earth. The spirits are also believed to be invoked by shamans who are called the thiralekara in theray ceremonies. The possessed dance in a frenzied manner and prophesize to believers who come before them. Botekara Ayyappa, the hunter god who rules the forests, leads the male spirits on hunts in the deva kaad (sacred groves). Kodavas also believe in helping out others. During marriages and funerals, they come together to help organize the arrangements and to pool in their individual contributions in order to help the family carry the expenses. The Haleri Rajas ruled Kodagu from around 1600 until 1834. Southern Kodagu, or Kiggat nad, remained outside Haleri control until the reign of Raja Dodda Virappa. Previously, Chittiappa Nayaka had ruled Anjigheri nad (‘nad of five villages’), Mathth Mukkati (short form for Maththur Mukkatira family name) Nayaka ruled over Maththur and Machangala (another form of Machangada family name) Nayaka ruled some other parts of Kiggat nad. According to the Kannada records, Chittiappa Nayaka belonged to the Katte family (manae) of Kiggatnad. The Kattera (long form of Katte family name) of Kiggatnad were an ancient Kodava clan. The Pattole Palame speaks of one Kattera Chengappa who helped build a temple to one of the 'Anji Deva' (five gods) of Kiggatnad. Likewise, there is a Kattemada family and a Katteyangada family in Kodagu's Kiggat nad. Periya patna (now in Mysore district) was under relatives of the Ikkeri Rajas and allies of the Haleri Rajas. Nanjunda arasa ('ruler') was the Raja of Periyapatna. Many Coorgs lived in Periyapatna at that time. A feud arose between Chittiappa Nayaka and Machangala Nayaka. A tiger was killed in the forest, which bordered both their territories, and both claimed to have killed it. Chittiappa’s claim was widely accepted and so Machangala grew jealous. One night, along with his ally Mukkati Nayaka of Maththur, he had Chittiappa’s house burned down and it’s inmates killed. However, Chittiappa’s son Achchu was saved by the housemaid who then escaped to Periyapatna where she sought and obtained refuge. Nanjunda arasa became a mentor for Achchu and got him educated in his palace. Upon his coming of age, he returned home and with assistance from Nanjunda arasa he defeated and killed his two sworn enemies who had destroyed his family. Then he annexed their territories and established himself as the Nayaka of Kiggat nad. Achchu Nayaka later got a memorial built for his mentor Nanjunda arasa of Periyapatna. The Kattera line ended in Kiggat nad but branches of the family exist in other parts of Kodagu. Hence Achchu Nayaka's property went to his relatives the Ajjikuttira. A number of Kodavas used to live in Periyapatna in those days. Later after Periyapatna was taken over by the Mysore Wodeyars, those Kodavas left that place and settled among the Kodavas of Kiggat nad. Hence the language and culture of Kiggat nad and surrounding parts have a slightly Kannada influence. The 'H' sound is largely absent in the Kodava language (which uses the 'P' sound instead) but present in the Kiggat dialect due to the Kannada influence. Hence Paal (milk) becomes Haal and Pann (fruit) becomes Hann in Kiggat. Otherwise Kiggat is the same as the rest of Kodagu. Belliappa, C. P. 2008. Nuggets from Coorg History. New Delhi: Rupa. 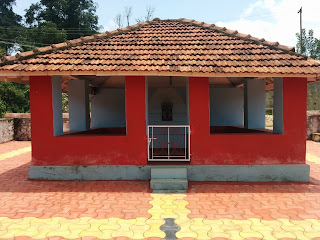 Chinnappa, Nadikerianda. 2003. Pattole Palame (Translated by Boverianda Nanjamma and Chinnappa into English) Delhi: Rupa. Chinnappa, N. 2006 . 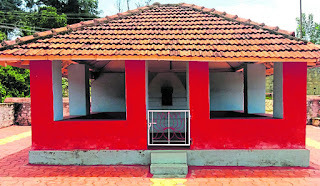 Pattole Palame (Kannada), Madikeri: Karnataka Kodava Sahitya Akademi. Krishnayya, D. N. 1974. Kodagina Ittihasa (Kannada), Mysore: University of Mysore. Moegling, Rev. 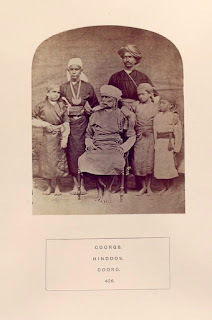 H. 1855 Coorg Memoirs: An Account of Coorg and of the Coorg Mission, Bangalore: Wesleyan Mission Press. Muthanna, I. M. 1971. The Coorg Memoirs (The Story of the Kodavas), Mysore. Richter, Rev G. 1870 Gazetteer of Coorg Mangalore: Basel Mission. Rice, B. L. 1914. Epigraphia Carnatica Vol 1. Madras: Madras Government Publications. Vidhana Soudha, the largest state legislature and secretariat building in India, is spread over 60 acres. Known as the ‘people’s palace’, it is built of Bangalore granite and porphyry. Bangalore first became the capital of Mysore State in 1831. The Bangalore Fort Palace was made the administrative building. But, later, the palace partly fell in, was deemed unsuitable and thereafter demolished. Hence, in 1868, the administration was moved into the Public Offices building inside Cubbon Park. This two-storied, Grecian building, surrounded by verandahs, was later to be called the Attara Kacheri, meaning 18 offices in Hindi. The name came because Mysore had 18 administrative departments. The British transferred powers in the Mysore State to the Maharaja in 1881. The State headquarters was moved back to the city of Mysore. That year, C V Rungacharlu, the then Dewan of Mysore, founded the first Representative Assembly of British India in Mysore. Thereafter, Bangalore’s Attara Kacheri came to the High Court of Mysore. The Assembly had 144 members, to begin with, and comprised landowners and merchants. It would meet twice in session every year at Jaganmohan Palace in Mysore. In 1891, the first Assembly elections were held for citizens above the age of 18. The Legislative Council was founded in 1907 with the view that it would assist the Government of Mysore in making laws and regulations. In 1923 the Legislative Council's strength was fixed at 50. The term of each assembly member was fixed at three years. While the semi-annual Assembly sessions continued to be held in Mysore, the budget session came to be held in Bangalore’s (K P Puttanna Chetty) Town Hall. On August 15, 1947, Mysore was made part of the Indian Union. Bangalore became the capital of Mysore State, once again. K Changalaraya Reddy was the first chief minister of Mysore State. The Assembly was held in the Library Hall of Attara Kacheri. This was continued until a separate hall was built on the third floor of the same building. The Council was also held on the third floor. The joint session of the two houses would be held in the Town Hall by the Rajpramukh, the Maharaja of Mysore. The need was felt for a separate and more spacious building. In 1948, the government wanted the chief engineer to construct a suitable office building. In 1950, the Constitution of India came into effect. Under the new constitution, the first Mysore Legislative Assembly was formed. It had 99 elected members and one nominated member. Mysore came to have a bicameral legislature, with two houses: the Vidhana Sabha lower house (Legislative Assembly) and the Vidhana Parishad upper house (Legislative Council). The 'House of Legislature' was first planned and decided by the KC Reddy cabinet. B R Manickam, a government architect and chief engineer, prepared the design. It was to have an Assembly hall for 200 members and a gallery for 500 visitors. It was also meant to accommodate a joint session of 261 members. In April 1951, plans for constructing the House of Legislature were ready. Jawaharlal Nehru laid the foundation stone on July 13, 1951. A stone plaque, now near the main staircase, was installed to mark PM Nehru's visit. A huge procession went out until Town Hall to welcome the then President of India Dr Rajendra Prasad. In February 1952, the plans and estimates for the roof of the auditorium were conveyed by the legislature secretary to the government. In April 1952, Kengal Hanumanthaiah succeeded KC Reddy as the chief minister. Hanumanthaiah dismissed the first design citing that the design was like that of a plain, American building. Meanwhile, members of a Russian delegation who were taken around the city stated that all the notable buildings in Bangalore were by Europeans. They further enquired whether there were no buildings that were designed and built indigenously. Subsequently, Hanumanthaiah travelled across the country to gain ideas on how to build an administrative structure. He started preparations for a building which combined the two legislative houses, the offices of ministers and government secretaries, a library, archive rooms, party rooms, etc. Funds were allotted in the 1952 budget and the work began in the same year. Manickam led a team of engineers and architects from the state public works department. As many as 5,000 people were employed as unskilled labourers and almost all of them were convicts. Over 1,500 chisellers, masons and wood-carvers were also employed. The result was the neo-Dravidian Vidhana Soudha legislative building, completed in 1956. Later, President Dr S. Radhakrishnan came to inspect the place. On November 1, 1956, Coorg (Kodagu), as well as the Kannada-speaking parts of Bombay, Hyderabad and Madras were integrated with the old kingdom of Mysore to form the new Mysore State. This resulted in the elected assembly seats increasing from 99 to 208. The first sitting of the Legislative Assembly in the Vidhana Soudha happened on December 19, 1956. In 1973, the then chief minister D Devaraj Urs renamed Mysore State as Karnataka. 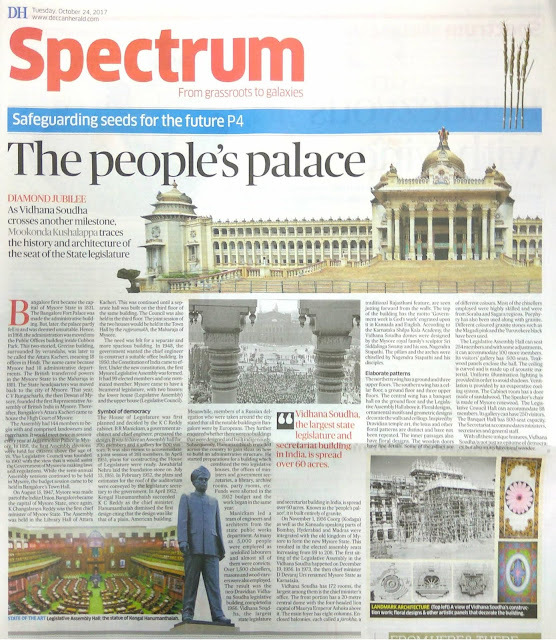 Vidhana Soudha has 172 rooms, the largest among them is the chief minister’s office. The front portion has a 20-metre central dome with the four-headed lion capital of Maurya Emperor Ashoka above it. The main foyer has eight columns. Enclosed balconies, each called a jharokha, a traditional Rajasthani feature, are seen jutting forward from the walls. The top of the building has the motto ‘Government work is God’s work’ engraved upon it in Kannada and English. According to the Karnataka Shilpa Kala Academy, the Vidhana Soudha domes were designed by the Mysore royal family’s sculptor Sri Siddalinga Swamy and his son, Nagendra Stapathi. The pillars and the arches were chiselled by Nagendra Stapathi and his disciples. Floral designs, ornamental motifs and geometric designs decorate the walls and ceilings. Inspired by Dravidian temple art, the lotus and other floral patterns are distinct and have not been repeated. The inner passages also have floral designs. The wooden doors have fine details. Some of the pillars are of different colours. Most of the chisellers employed were highly skilled and were from Soraba and Sagara regions. Porphyry has also been used along with granite. Different coloured granite stones such as the Magadi pink and the Turuvekere black have been used. The northern wing has a ground and three upper floors. The southern wing has a cellar floor, a ground floor and three upper floors. The central wing has a banquet hall on the ground floor and the Legislative Assembly Hall above it. The Legislative Assembly Hall can seat 254 members and with some adjustments, it can accommodate 100 more members. Its visitors’ gallery has 500 seats. Teakwood panels enclose the hall. The ceiling is curved and is made up of acoustic material. Uniform illumination lighting is provided in order to avoid shadows. Ventilation is provided by an evaporative cooling system. The Cabinet room has a door made of sandalwood. The Speaker’s chair is made of Mysore rosewood. Every member has separate microphones and earphones whose master control is with the Speaker. The Legislative Council Hall can accommodate 88 members. Its gallery can have 250 visitors. The Banquet Hall has an 800-seat capacity. The Secretariat accommodates ministers, secretaries and general staff. With all these unique features, Vidhana Soudha is not just an epitome of democracy, but also an architectural wonder. The building is illuminated during the evenings on Sundays and public holidays. Entry is prohibited to the general public. In 2005 Chief Minister S. M. Krishna built the Vikasa Soudha as an annexe to the Vidhana Soudha. On 30th April 2016, an underground metro station was opened near Vidhana Soudha. This is named after Dr B. R. Ambedkar. It was constructed by means of carefully blasting the underlying rocks without disturbing the Vidhana Soudha and Attara Kacheri premises. Karnataka has got 225 Members of the Legislative Assembly (MLAs) and 75 Members of the Legislative Council () today. On October 25 and 26, this year, a two-day state celebration is being held to commemorate the diamond jubilee of the Vidhana Soudha. President Ram Nath Kovind will address a joint session of the Karnataka Legislature on October 25th. His 90-minute speech is on the Vidhana Soudha and Karnataka's contribution to the nation. Families of the first three Chief Ministers of Mysore - K. C. Reddy, Kengal Hanumanthaiah and Kadidal Manjappa will be honoured. Several people will receive the ‘Lifetime Achievement Awards’ for their contributions towards the development of the State. Girish Kasaravalli’s documentary on the Vidhana Soudha and T. N. Seetharam’s documentary on the Karnataka Legislature will be screened. Master Kishan, former child artiste and director, will produce a 3D mapping and virtual reality show on the Vidhana Soudha. This will give viewers a 360-degree view of the structure. Grammy Award winner Ricky Kej and his team will present a musical symphony. The PWD will wash and renovate the Vidhana Soudha and also spend Rs.3.5 crore on the lighting alone. The 1870 'Gazetteer of Coorg' by Rev. G. Richter, a British missionary and educationist, has a photograph labelled as 'Coorgs: grandfather, father and grandsons'. The seated grandfather sports a handlebar moustache, a mark of distinction, and wears a 'Coorg Medal', in order to identify himself as being a recipient of it. 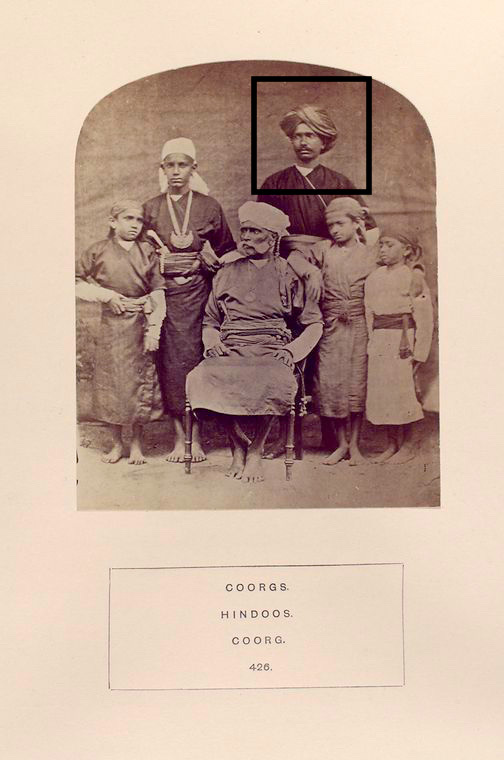 According to the 1875 volume of 'People of India' series, where the same picture is labeled as 'Coorgs. Hindoos. Coorg', he is called 'Mattana', 'Soobadar of Mercara', shown along with 'his younger relatives'. 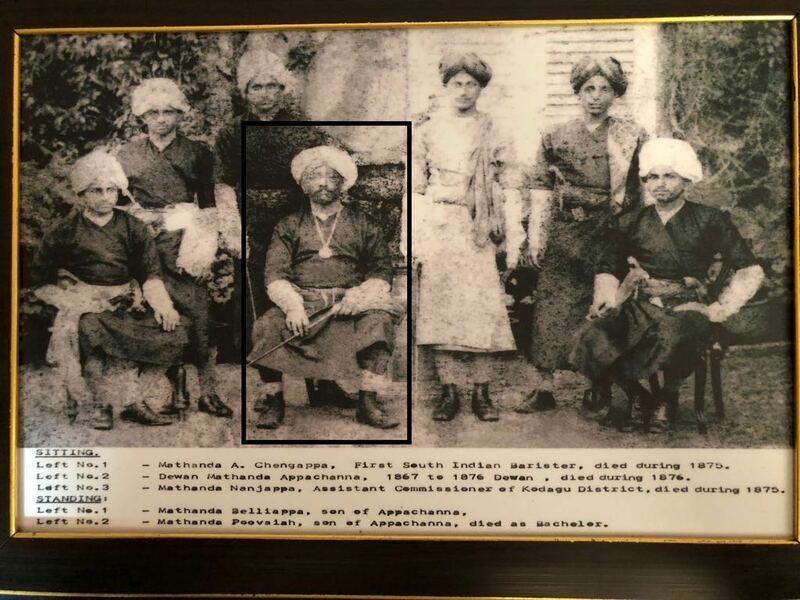 Based on a list of 'Coorg Medal' recipients, found in Mark Cubbon's letter and replicated in folklorist Nadikerianda Chinnappa's 1924 book Pattole Palame, I have been able to identify this 'Mattana', 'Madanta' and 'Appachanna' as Subahdar Mathanda Appachu, later Head Sheristadar and Diwan. In his book Richter speaks of 'the present Head Sheristadar Madanta Appachu, a fine old Coorg, of tall stature and martial bearing' on page 337. Again on page 363, Richter talks of 'Subedar Appachanna the present Head Sheristadar'. Richter notes that though Coorg was jealously guarded by the antagonism of its conservative headmen, it had to yield to the onward march of civilisation. 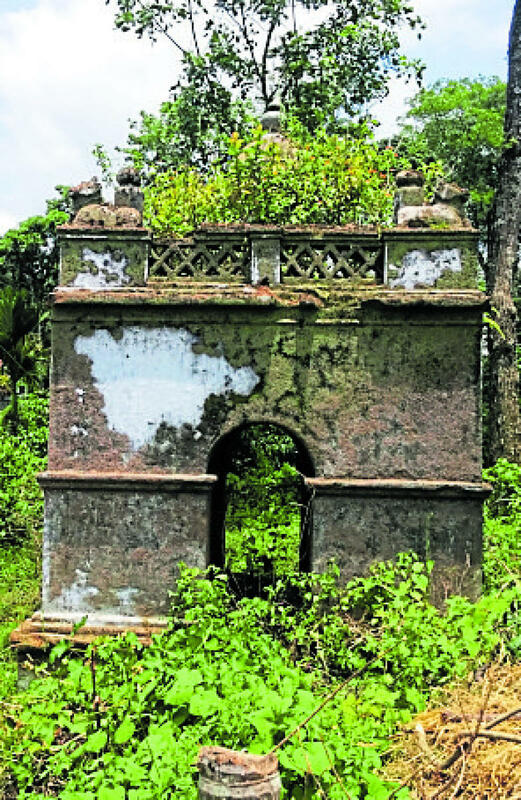 1834 War Hero Mathanda Appachu's mausoleum, lying in neglect. He fought the British successfully as a Karyagara. In 1834, the British East India Company sent an army of 6,000 sepoys to invade Kodagu. This force, of the Infantry of the Company's Madras Army, was divided into four columns. One column was to march into the region from the east, one from the north and two from the west, until they reach Madikeri, the capital of the princedom. The Northern Column of the Company's Infantry was to meet the Eastern Column near Harangi village. But another village near Somwarpet town, secured well by a Bakka and in a forested mountain pass, stood their way. The Bakka was a defensive structure comprising of a mud ditch, fortified with thick wooden palisades. This village was the chief base of the resistance in Kodagu. Karyagara Mathanda Appachu and his men were in the defense of that Bakka. They fought hard against the Northern Column. This Kodagu force aimed their guns and shot at the British from behind wooden palisades and through the arrow-slits of those palisades. Appachu and his warriors killed 48 soldiers, including three officers, and injured 118, within four hours on that one day. No casualties were reported from the Kodagu side. Thus, this Kodagu troop was able to beat the larger and more well-organised East India Company at that time. Appachu then swore loyalty to his erstwhile enemy. He was made a Subahdar, or native governor. A few years later, Subahdar Mathanda Appachu and sixty men suppressed some rebels who had planned to take over Madikeri. For this Appachu was awarded the 'Coorg Medal'. A letter from Chief Commissioner Mark Cubbon to the Superintendent of Coorg mentioned Appachu's name adversely. 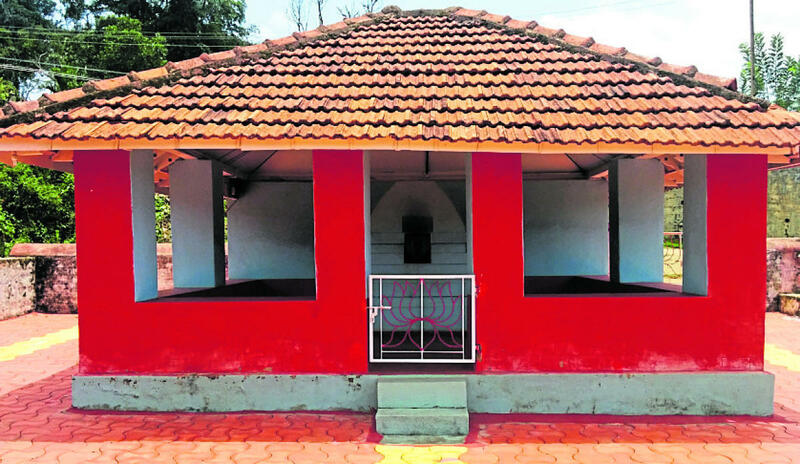 'Subadar Appachoo', like others of his times, had shown his extreme displeasure to the conversion of one Almanda Somaiah and his family into Christianity. This was despite the British Government's assurances to Somaiah. Yet, years later, Appachu was promoted to Head Sheristadar, the highest native judicial position. In Kodagu a certain folk song describes the ancient local government in the region. Eight hereditary chieftain clans called the desa thakka (regional chieftains) resided in places spread across Kodagu. The Mathanda, pronounced as 'Maa-ththan-da', clan were one of these eight. Once the two came to a stream where they wished to wash their faces and limbs before having lunch. Karicha put down his weapons and washed himself first. Not suspecting anything to be amiss, the sorcerer also put down his weapons and stood at the bank of the stream. Finding this to be the opportune moment, Karicha sprang up, grabbed his weapons and killed the sorcerer. When the Raja got the news he was highly pleased and so rewarded Karicha. To a Kodava living outside Kodagu, Kail Podh is one of those days when one gets to encounter their unique cultural traditions. While in Kodagu the festival is celebrated on different days, elsewhere Kail Podh is observed at homes on the third of September. After the Putthari harvest festival, Kail Podh is the next important festival of the people from Kodagu. On this day the community usually gathers in their public spaces and celebrate the event. The Kail Podh day begins with the youngsters touching the feet of their parents. Traditional and household weapons, such as guns, war knives, swords, spears, bows and arrows, are cleaned and placed near the thookbolcha (hanging prayer lamp) in the house. Thokk Poo (Glorioso Superba flowers) are placed upon the nozzles of guns placed upright against the wall. Prayers are made facing the thookbolcha. The Kodava deities, the river deity Kaveramma, the chief preceptor Mahaguru Igguthappa and the supreme ancestor Guru Karana, are invoked. The women get together in the kitchen and prepare Kodava cuisine. Traditional rice dishes such as steamed dough balls called kadambuttu, voti bread, paaputt plain cakes and nooputt noodles, along with meat dishes such as Pandi (pork) curry, Koli (chicken) curry and Yerchi (mutton) curry as well as desserts like akki payasa (rice kheer) are cooked and served. The family members then partake these meals with relish. Outside Kodagu, the Kodava Samajas organise folk dances, sports, such as shot put, rifle shooting and other cultural events. In Kodagu these events happen at the various village greens, or Mands, of Kodagu. The Kodavas usually wear traditional costumes on this day. Kodava cuisines, especially pork and rice dishes, are prepared and served on these events. The Kodavas maintain the weapons of their ancestors as far as possible. They are handed down from generation to generation. During weddings, male representatives of families related to the bride and the groom cut banana stalks each with a single stroke of the Odi katti (large Kodava warknife). A gun is fired in the air during the birth of a son and at the death of an individual. This is meant to announce the news to the neighbours. Upon hearing the gunshot the villagers will gather at the house. The Kodavas worshipped weapons in keeping with their martial traditions. Their ancestors owned arms of various kinds. They had different native war knives, among them billhook shaped odi katti, ornate, sheathed, small piche katti and straight bladed baal katti. They also had spears and straight bladed long knives known as Barchi. Wishing all the Kodavas and other people from Kodagu a very happy Kail Podh.